"The Terminator" Arnold Schwarzenegger says US President Donald Trump is making a "big mistake" on environmental policy. Making his annual pilgrimage to the famous ski races in Kitzbuhel, the Austrian muscleman, movie star and former governor of California was in the grandstand to watch the second leg of Saturday's slalom race. 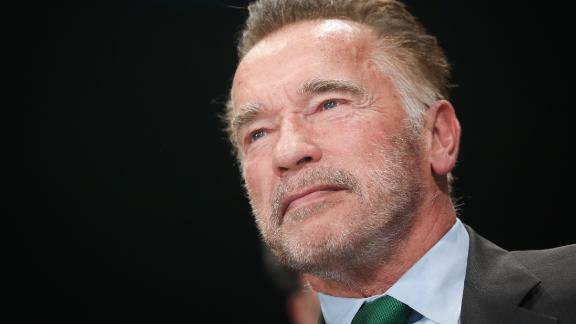 Schwarzenegger, who launched the R20 climate change organization in 2011, said seven million people die every year because of global pollution, a reference to a World Health Organization report released in December. "It is extremely important that in order to be successful with our environmental crusade and to fight global climate change and to fight all of the pollution we have worldwide, we all have to work together," Schwarzenegger told Christina Macfarlane for CNN's Alpine Edge at the Rasmushof Alm hotel in the upmarket resort. "And the more people we bring into the crusade the better it is. The world leaders alone have not been able to solve the problem and they won't. "Whether it is the Indian movement or the women's suffrage movement, or anti apartheid movement or the civil rights movement in America -- none of those were solved in the capitals, always by people. So people power is essential." Late last year Trump, who previously has called climate change a "hoax," rejected his own administration's report that climate change could be devastating for the economy, saying "I don't believe it." "The United States is in, it's just the federal government is not," added the 71-year-old Schwarzenegger. "Every city in America is on board to cut back on pollution. There's tremendous innovation in technology and design. Everyone is working together, except Trump. "Eventually one day he will wake up and he will realize he made a big mistake to sell out to the oil companies and coal companies rather than to sell out to the American people. "The message is, he has his beliefs, I have mine. Even though he is wrong on this issue I still wish him the best of luck because if our President is successful and we as a country are successful, the world is successful." Schwarzenegger grew up in Styria and is a long-time ski enthusiast. "It's not just global climate change, it's about the pollution that it creates that kills so many people worldwide," he added. "Seven million people die every year — this is inexcusable. We have to fight, we have to do something about it, and the only way we can win is by doing it together." Schwarzenegger said one of the major problems in the fight is that climate change and global pollution have "no borders. "It doesn't matter if you come from a naturally clean country like Austria or Brazil, we all have to work together to fight this problem of this unbelievable pollution that eventually going to kill everyone," he added. "The world leaders need to take it seriously and put a time clock on it and say, 'OK, within the next five years we want to accomplish a certain kind of a goal,' rather than push it off until 2035." Austrian skiing great Franz Klammer, the 1976 Olympic downhill champion and four-time Kitzbuhel winner, is an ambassador for Schwarzenegger's program. "We really have to take care of our planet for the future of our children," he told CNN. "If we're not taking action now it will be soon too late. "That's why it's very important Arnold is out speaking about this subject a lot, just to make us all recognize it is almost 12 o'clock. We have to take action." This is not the first time Schwarzenegger has taken stabs at Trump. Last year, the movie-star-turned-politician spoke out against Trump's "zero-tolerance" policy for illegal border crossings, which led to children being separated from their parents.